What started as a collaboration between photographer Sara Lohman and Ciro Supino a fashion design student at the time soon became Orphan Bird. Their Sweden-based label infuses a Scandinavian aesthetic with Italian tailoring. 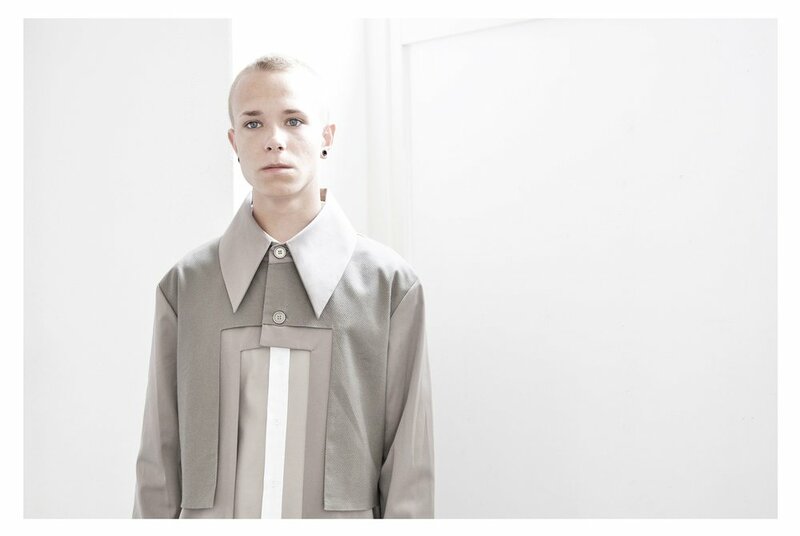 Think minimal, retro futuristic and androgynous; their line has both men and women's pieces. They knew that fashion was the medium that would allow them to create art and functional garments for an eclectic woman. The basis of the line is timeless pieces that don't go with the trends. They told us that it's about "unconventional garments that follow their own natural shapes." For spring/summer 14, buildings in the middle of empty fields was the inspiration for Empty Blocks. Sara told us, "A line between perfection and nothingness gave us the idea to transform something that has been given up halfway through into a platform of creativity..." Adding in their own interpretation of tailoring, they designed distinctive geometric overlay details throughout the collection by manipulating patterns and cutting out various shapes. With boxy silhouettes and bold patterns in a spectrum of grays and creams, the aesthetic works well for both men and women. Signatures include their coats and jackets that are dramatic yet simple and with their focused vision, it's a brand that will be relevant each season and offers pieces that define a wardrobe. Learn more at Orphan Bird.